Seagrass and organic cotton come together for pure crossbody bag perfection. Make way for some natural beauty in your accessory collection—this crossbody is thoughtfully made from seagrass and organic cotton. Hand-screenprinted stripes add an artful touch on top, while the woven base brings in a bit of unexpected texture. 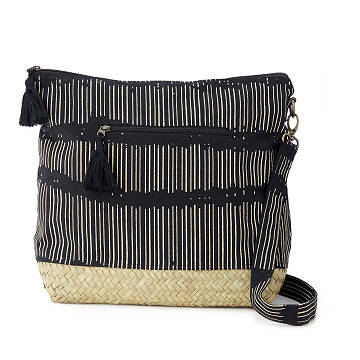 Roomy enough to hold your essentials, while still compact enough to sling comfortably over your shoulder (and yep, those straps are adjustable), this is one you'll want with you on the daily. Handmade in Cambodia.